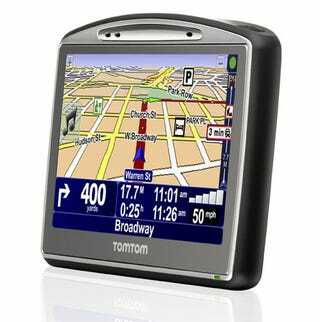 There are many sweet things about TomTom's new $499 Go 720, but the most important feature is Map Share. If you've ever driven with GPS, you know how annoying it is when map data is wrong. Now, as you drive along, you can make five different kinds of correction on the fly. You can say if a street is blocked (or unblocked), note a change in street's direction, add a name or rename a street, add a point of interest, or remove or rename an existing point of interest. If there are other changes to be made—say you've discovered a new road—you can report those in to TomTom with the touch of a button. Find out how it works, and what else is going on with the 720, after the jump. As you're driving and you notice something weird, you can tap on the appropriate corrections icons. It's not completely thorough, but you can get pretty detailed. Then you bring the 720 home and sync it via USB. The good news is that when you sync your changes, you can also subscribe to other changes. The bad news is that changes are not updated in real time. If I spot something, the absolute soonest you'll get wind of it is a day later. Even if you don't sync, you will automatically see changes you made yourself, but if you do sync, you can also get, in order of trustworthiness: changes verified by TomTom, changes to assorted POIs you subscribe to, changes from sources trusted by TomTom, changes reported by "many" and changes reported by "some." &bull A "Help Me!" menu in case of emergency, which tells you your exact position in a language that can be understood by 911 operators and pick-up truck drivers alike. For more details, feel free to skim the slides in the gallery below.